LASAK implant systems | LASAK Ltd.
LASAK IMPLADENT and BioniQ implant systems are suitable virtually for everyone. They can be applied both to young people who have lost one or more teeth due to an accident, and to people who lose their teeth as they age. LASAK implant systems offer a great variety of components designed for the individual treatment of every single patient. The implants boast perfect functionality, long service life and a high esthetic result. The bioactive implant surface developed by LASAK remarkably increases the formation of new bone on the implant surface, thus reducing the healing period and the overall treatment process. In some cases, LASAK implants can be loaded immediately after insertion. This particular benefit is proved by clinical tests published in a number of dentistry scientific papers as well as in papers from other fields. The tests have proved the implants’ 98.8% healing effectiveness. The LASAK BIO-surface was the first hydrophilic bioactive surface of titanium implants on the market and this concept of surface treatment was soon adopted by leading world manufacturers and is now used all over the world. LASAK has been awarded the prestigious Scientific Award “Ceska Hlava 2010” (Czech Brain) in the category Industry for the innovative bioactive surface of LASAK implants as the best technological and product innovation in the Czech Republic. The Ceska Hlava company launched a project in 2002 dedicated to supporting and promoting Czech science and technology. In the framework of the project, the company has granted yearly awards to the best scientists and engineers, which have become nearly as prestigious as the Nobel Prize within the Czech Republic. Clinical studies show that LASAK’s unique BIO-surface of dental implants speeds up bone tissue formation and reduces the healing period of implants. In specific cases, implants can be loaded immediately after insertion. Insertion of one implant takes approximately 15 minutes. Insertion is performed under local anaesthesia. The treatment is less painful than the treatment required for other types of dental restorations, such as grinding the teeth for the preparation of a bridge. The pain experienced by patients is comparable to the pain accompanying tooth extraction. Your dentist can choose from a wide range of prosthetic components for the most appropriate and esthetic solution for your personal needs. Perfect stability of the restoration is achieved thanks to the screw-shaped implant and other stabilizing elements. 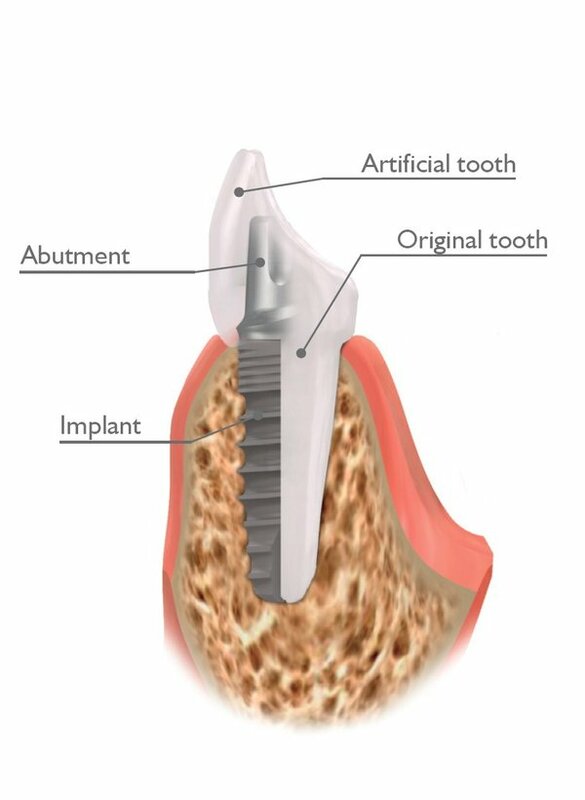 The bioactive surface of the implant provides a strong connection between the bone and the implant surface. At the same time, LASAK implants are designed to distribute the mechanical stress evenly when loaded. The service life of the implant depends mainly on the patient and on how much care the patient takes of the restoration. You have to pay attention to regular and careful oral hygiene, as the good hygienic condition of the mouth is absolutely essential. If you take good care of your implants, it is highly probable that they will last you for the rest of your life. IMPLADENT is the most widely used dental implant system in the Czech Republic. Over the many years of clinical use of unique bioactive surface, IMPLADENT is considered one of the world’s best. The IMPLADENT is also used in many other European countries. The system was put in 1993. BioniQ dental implant system was launched in 2013 and builds on its successful predecessor – IMPLADENT system. It uses the same BIO-surface as IMPLADENT and also follows the latest trends in implantology. LASAK dental implants are made of unalloyed titanium, which is not rejected by bone tissue as an alien body; on the contrary, it creates a direct and strong bond with it. LASAK implants are manufactured in accordance with the international ISO 13485 standard.